Hillside property with stunning views of Sarnano and the Sibillini Mountain National Park. Fully equipped, self-contained property situated at over 600m altitude, with a large garden which is completely fenced off. Private terrace for outdoor dining/relaxing. Free WiFi. The house is in the small village of Poggio, halfway between the popular spa town of Sarnano and Gualdo. The mountains are just a short distance, with winter skiing, and superb summer walks. A public outdoor pool is located in nearby San Ginesio, with a covered municipal pool, tennis courts and crazy golf in Sarnano. Adriatic beaches are a 1 hr drive, with the National Park and Lake Fiastra 30 mins away. I live in the UK with my husband, 2 sons and chocolate labrador, Marmite. We worked in Italy for 3 years from 2001-2004 and fell in love with the country. We travelled around Italy looking for the ideal spot for a holiday home and settled on Le Marche. It is stunningly beautiful; we love the mountains, beaches, food and wine and have made lots of friends in Sarnano. We go back as often as my husband's work schedule allows. We bought in the spa town of Sarnano as it is stunningly beautiful. We love the fact that we are on the edge of the Sibillini National park (great for skiing, walking and Fiastra Lake), close to lots of hilltop towns for days out and also have easy access to the beaches on the Adriatic Coast. Sarnano is only 1 hr and 15 mins from Ancona Airport and is perfect for a relaxing holiday. The property is located in Poggio, just 5 minutes out of Sarnano. You have sole use of the property as the downstairs apartment is not let and used only by us when no one is renting. The large garden is fenced off and so suitable for bringing a dog. The views of the Sibillini mountain range from the south facing terrace are simply stunning. There are lots of fantastic, reasonably priced restaurants, osterias and pizzerias nearby. You will have the benefits of the property and enclosed garden to yourselves. It is perfect for a relaxing family holiday. Free wifi. Bathroom with shower, wc, bidet and basin. Notes on accommodation: Cleaning and linen change weekly. Portable air-conditioning unit (not fixed - ventilation required). Central heating (€50/week Nov-Mar inclusive). The steps up to the front door (see picture above) may not be suitable for very small children. Smoking not permitted in property. Outside: Terrace with stunning views. Outdoor furniture and BBQ. Large garden. Lots of parking space available. Cleaning / Towels / Linen / Maid service: Towels and linen included. Other: Access to washing machine downstairs. 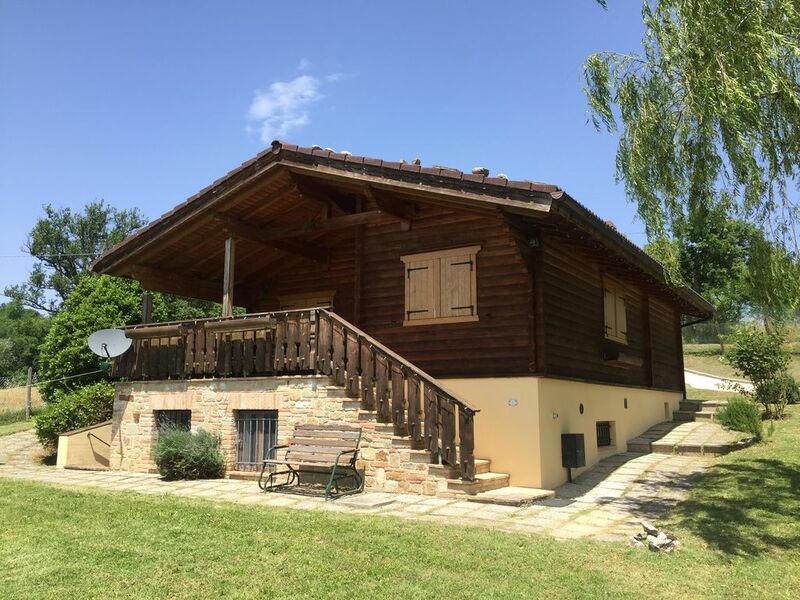 We had a fantastic 5 day break in this stunning home-from-home in the beautiful hills overlooking Sarnano. This was a short break with 2 adults and a 2 year old and we never had a dull moment exploring the area or sitting on the Veranda with a glass of vino soaking up the views. The guides in the house meant we were never short of things to do or places to eat and the evening light shows provided by the fireflies were particularly spectacular. Our son was fascinated by the tractors working the nearby fields too! This was our second visit to Sarnano and we will definitely be back again. Thank you for providing such a wonderful place to stay. Incantevole baita con una vista splendida sui monti Sibillini. La baita è circondata da un bell'ampio giardino, graditissimo ai nostri cani e magnifico per le nostre serate rilassanti, soprattutto per chi ama come noi osservare le stelle. E' posta su di un pendio da cui si può godere un panorama mozzafiato sui monti sibillini. La zona è tranquilla e offre innumerevoli attrazioni e splendidi borghi medievali da visitare. La casa è deliziosa e semplicemente... perfetta! pulita, ordinata e ricca di ogni confort! Thank you so much for your fantastic review Tiziana. I am delighted you enjoyed your stay and look forward to welcoming you back. Best regards. Een heerlijk huisje met een prachtig uitzicht! Het huisje is van alle gemakken voorzien. We voelden ons er helemaal thuis. Many thanks for your review Wilma. We are so happy you enjoyed the property and the view! Best regards. Sibillini National Park with stunning mountain walks. Fantastic summer swimming and fishing at Lake Fiastra. Paragliding at the nearby Sibillini Paragliding School. Wine tasting, truffle hunting, language courses, Macerata open-air opera in August. Seaside towns along the Adriatic coast are 1 hr drive away - Civitanova, Porto San Giorgio, Mount Conero National Park with wonderful scenery and clean blue waters. Ideal for low cost airlines. Nearest airport is Ancona, 1 hr 30 mins. Other options are Pescara, Rimini, Forli, Rome, Pisa. Car hire available from airports. Ancona 1 hour 30 mins. Assisi, Urbino, Republic of San Marino within 2 hours. Poggio is surrounded by sensational countryside and has all facilities nearby. Gualdo has a bank, baker, cafe, restaurant, greengrocers, butchers and post office. For a larger selection, Sarnano, with its well preserved medieval town centre, is only slightly further. There are plenty of interesting walks and cycle routes in the immediate area. The Sibillini National Park and Lake Fiastra, which offer superb outdoor activities, are only 30 minutes away. Sarnano has tennis courts, swimming pools, crazy golf, fishing lakes, riding schools and the prestigious Sibillini school of paragliding. It hosts an Antiques Festival in May and the ‘Palio’ in August. Macerata, the provincial capital, has an outdoor opera festival during July and August is one of the best venues outside Verona. There are many nearby medieval hilltop towns to explore and extensive Roman ruins at Urbis Salvia and Falerone. The area has many good local restaurants. Booking Notes: A deposit of £150/€150 is required to secure the booking. The balance is to be sent before your stay to the owners’ UK or Italian bank account. A security deposit of £100/€110 will be added and will be returned to the guests within 2 weeks of the end of the holiday minus a central heating charge if used. Changeover Day: Generally Saturday to Saturday, but we are flexible if it helps our guests take advantage of cheap flights. Guests should arrive after 3.00pm and leave by 12.00am on the morning of departure. Notes on prices: Prices are for the property per week in UK Pounds.